 Maximize your KTM's sump protection without sacrificing ground clearance. 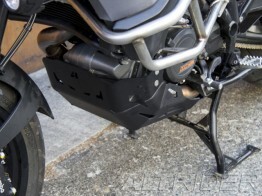 New AltRider Skid Plate for the KTM 1190 Adventure in anodized silver or black. While some claim that the KTM 1190 Adventure is more street-oriented than the 950 and 990 of years past, the latest orange beast has no problem holding its own against the other ADV bikes on the market. Ride-by-wire throttle, state of the art motorcycle traction control and 150 horsepower combine KTM’s Ready to Race mantra with an excellent touring platform. Adventure touring motorcycle outfitter AltRider has added a full suite of accessories to their lineup for the new KTM. The AltRider Skid Plate for the KTM 1190 Adventure and Adventure R features an exclusive mounting system that provides maximum protection while maintaining superb ground clearance. Stainless steel rear brackets utilize massive M10 engine mounting bolts, which pass through a stout frame mount. AltRider has the only design that mounts with the engine bolts and the foot peg mounting bolts, creating a foundation that can take serious hits without transferring force to the motor. AltRider KTM 1190 Adventure Skid Plate in anodized black. The unique keyed design of the rear brackets provides nearly the same strength as a one piece bracket, while making installation a snap. Because KTM mounts the side stand bracket directly to the engine, one ill-placed rock can cause catastrophic motor damage. 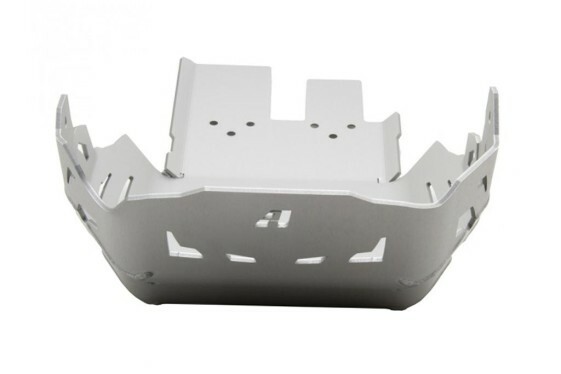 The AltRider skid plate extends outwards to provide necessary coverage for this vulnerable mount. This eliminates the need for a side stand relocation kit, which can cause problems by moving the stand away from the center line of the motorcycle. Precision manufactured from 3/16″ anodized aluminum, the plate gives serious lightweight coverage for the motor, stator and clutch pack. The Skid Plate is available now in anodized silver or black.